Pro Painting is an interior and exterior painting contractor. We offer painting contractors for interior or exterior repair or decoration of residential and commercial properties. 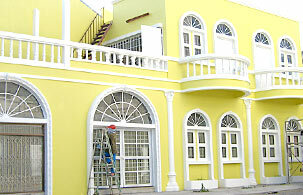 Our staffs are expert in interior & exterior painting. Include the consultation in waterproofing systems and painting. Port & Marine Coperation (P.A.M) Co., Ltd.
Numchai Ocean Transport Co., Ltd.